When you breathe indoors, all you should want is pure, clean air which is a basic necessity anywhere we live or work. But that was not always possible until now. We have assembled the most advanced air purifiers yet developed to eliminate smoke, secondhand smoke, odor, dust, mold, allergens, pet odors and even help reduce mold, mildew, allergy symptoms more than any other indoor air purifier on the market. Ionic and using UV light to break down pollutants, these units which, have clinically been proven to remove cigar and cigarette smoke, create a zone of clean and pure air in offices, homes, agencies of our Federal Government, farms, factories, hotels, Bingo halls, restaurants, bars, cafeterias. kitchens, restrooms, break rooms, or where smoke and pollutants are a problem. Physical size of units Biozone PR05, Biozone PR10, and Biozone PR20 are the same, the negative ion generator engine inside is different. This Bizone PR05 is ideal for spaces from 150-500 sq.ft. 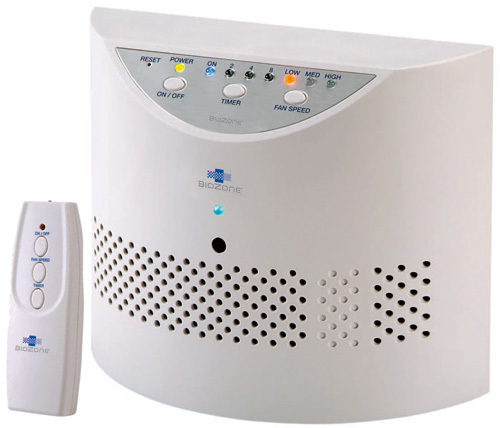 Biozone PR05 ia an advanced air purifying device that produces dramatic improvement in indoor air quality for your home or office by removing cigarette & cigars smoke and it's secondhand smoke effects. Biozone units are nearly silent and are maintenance free. Covered by a 1 year warranty and money back guarantee. Click on the image or here to see specifications and read more details. Ideal for apartments, small homes and offices up to 1000 sq. ft. Biozone PR10 air purifier is unlike any other air purifier available. Biozone PR10 cleans the air of cigarette & cigar smoke and the secondhand smoke and biological contaminants like bacteria, viruses, and mold, destroys hazardous fumes, removes harmful particulates, and neutralizes all unpleasant odors. Stop the neighbors from complaining. Backed by a 1 year warranty and money back guarantee. Biozone PR10 Available in "White" only. Designed for meeting rooms or spaces up to 2000 sq. ft. Biozone PR20 air purifier is the ultimate in clean air purification. Biozone PR20 cleans the air of cigarette & cigar smoke and and it's secondhand smoke effects, biological contaminants like bacteria, viruses, and mold, destroys hazardous fumes, removes harmful particulates, and neutralizes all unpleasant odors. Remove the effects of secondhand smoke and keep your clothes and belongings from smelling like cigarette smoke. Backed by a 1 year warranty and money back guarantee.